Lee Oululani Plevney designs Hawaii ocean inspired ceramic art. 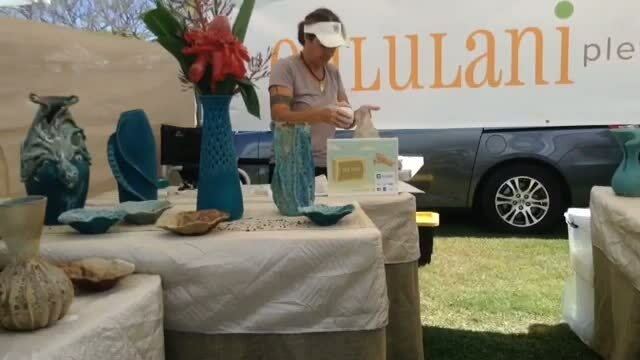 Lee enjoys sharing her work at the Maui Swap Meet! YBEAM reporter Liam Mathis profiles Lee! Awesome! Beautiful work, Lee! And great interview, Liam! Thank you for this great video about Lee and her beautiful ceramics! We own one of her gorgeous bowls and love how versatile and functional it is. It’s also a constant reminder of this gentle soul whose work is sought after across the US from the eastern seaboard to Hawaii!